San Diego, California’s second-largest city, is often known as a laid-back beach-bum hangout. However, the city was dubbed the “newest cultural Mecca” in the United States by Travelocity due to the world-class museums, cultural events, and fine dining that co-exist with its miles of beaches and perpetually sunny weather. February is an ideal time to visit, as visitors will enjoy mild temperatures, several natural phenomenons, and a host of festivals. Why San Diego in February? Whale watches, wildflowers, and sunny weather mark February in San Diego. While many parts of the country experience frigid winter temperatures, visitors to San Diego enjoy weather in the 50s and 60s—nice enough to spend days outdoors. February also brings celebrations for Mardi Gras and Chinese New Year—expansive street festivals with food and music, and museums are discounted all month long. February is “Museum Month”, which means half-price admission to 30 museums, including Birch Aquarium, the Maritime Museum, the Museum of Contemporary Art, the San Diego Aircraft Carrier Museum, and Quail Botanical Gardens. To take advantage, visitors should pick up a Museum Month brochure at any Robinsons-May store in San Diego County beginning February 1. In addition to discounted admission to San Diego’s most popular museums, there are plenty of outdoor events and festivals in February in celebration of nature, holidays, culture, and history. December through April marks San Diego’s whale-watching season, when about 20,000 gray whales migrate to breeding lagoons at the tip of Baja, California. Two popular outfitters, Hornblower and the San Diego Harbor Excursion, offer three-and-a-half-hour whale watching boat tours, and prices range from $15 to $30. 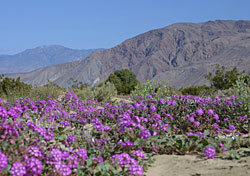 Daytrippers, hikers, and photographers will be interested to know February is the beginning of wildflower season at Anza Borrego Desert State Park, a two-hour drive from San Diego. For about two weeks in late February through April, wildflowers hit their peak at the park, which is the largest desert state park in the contiguous U.S. However, it’s difficult to predict when the peak will occur, because factors like rain, temperature, and desert winds affect the wildflowers’ growth. Even if flowers aren’t at their peak in February, the park has 110 miles for hiking and riding, as well as two campgrounds. Chinese New Year takes place each year in late January or early February. This year, a two-day Chinese New Year food and culture festival takes place February 11 and 12 in the Asian Historic Thematic District (Third Avenue and J Street). The fair features more than 50 food and craft vendors, as well as a lantern parade. The 14th annual Kuumba Festival, a celebration of Black History Month, takes place February 24 through 26 at the Lyceum Theatre in Horton Plaza. The festival, sponsored by the San Diego Repertory Theatre, includes a gospel concert, an African marketplace, creative workshops, and guest speakers and artists. Several San Diego neighborhoods host outdoor Mardi Gras street parties. This year, celebrations will take place in both the historic Gaslamp Quarter and in Hillcrest on February 28. The celebrations include parades, food, street performers, and live music. Both events are restricted to people ages 21 and over. During the winter, San Diego experiences more rain and lower temperatures than at other times of year. However, weather in the mid-50s and 60s and a little rain should not deter visitors, especially with hotels offering winter specials. Plus, with Valentine’s Day on February 14 and President’s Day on February 20, there are plenty of excuses to travel. The San Diego Convention and Visitors Bureau website lists hotel rates from $58 in February. In addition, the website showcases hotel packages that include anything from a GoCard sightseeing pass to tickets to SeaWorld, the San Diego Zoo, the Old Town Trolley, and other popular attractions. Travelers can also order a free San Diego Vacation Planning Kit that includes coupons for a variety of hotels, attractions, activities, dining, and transportation. In addition, several hotels are offering reduced rates and special packages to attract winter travelers. For example, the Hotel La Jolla is offering rates of $159 per night in February, compared to regular room rates of $179 to $229. Loews Coronado Bay is offering winter rates of $179 per night with its Winter WonderLoews promotion, a savings of $30 to $60. The Hilton San Diego Gaslamp Quarter is offering a “Frisky on Fifth” couple’s romance package for $495 for two nights in February—a bargain compared to the regular room rate of $499 per night. Those who prefer traveling on a whim can consider booking a last-minute weekend package with Site59.com. The website offers several different San Diego packages, and rates for airfare-and-hotel packages tend to cost less than airfare alone. Getting to San Diego doesn’t have to break your budget. In addition to all of the legacy airlines, low-fare carriers including Alaska, Frontier, JetBlue, and Southwest all serve the city. Also, San Diego is about a two-and-a-half-hour drive from Los Angeles, close enough to be an easy day or weekend trip. For more information on planning a February visit to San Diego, visit the San Diego CVB’s website and SignonSanDiego.com’s visitors guide. Sunny days, unique events, and winter hotel deals make San Diego an affordable—and fun—winter getaway.